For types G, C or D, Consult Sales for pricing information. 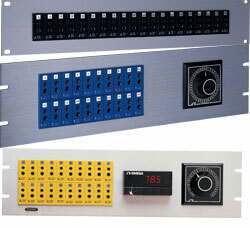 OMEGA's 19SJP series are standard size thermocouple sockets mounted in 19 inch rack mount panels. The panels are made of clear anodised aluminium. They are available with 10 to 40 sockets with optional cutouts for selector switches and meters. Rows Panel Height Switch Size Max. No. Example part numbers are shown below. Please use the Part Number Builder below this table to select your exact configuration.